This high visibility safety vest keeps personal and medical equipment close at hand. The MCI vest is designed for Mass Casualty Incidents and medics who require both a pack and a highway EMS vest. This EMS vest is also an ergonomic alternative for medics who cannot (or choose not to) wear a backpack. Not only just for Medics, make sure your traffic controllers, crossing guards, parking operators, road crews and other outdoor workers are visible to the traffic around them. One-size-fits-all (over clothes) with velcro adjustments on the front, shoulders, and sides. 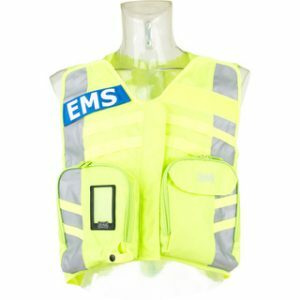 This makes ordering EMS vests a breeze for larger departments with many different personnel. 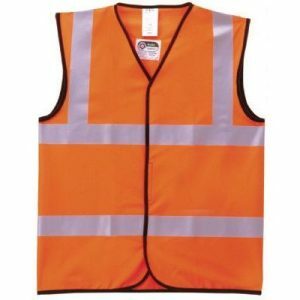 These Velcro fastening waistcoats are made from 130gm knitted polyester with two bands of 3M reflective tape around the body and over the shoulder for high visibility. All edges are bound in black nylon for maximum wear and comfort. Offering excellent value for money, without compromising on safety.